This is a 2250 tube with a 2240 standard length barrel. shooter to view through the scope at arms' length. - LPA MIM rear sight. - Fiber Optic front sight, but blacked out on the sides (for looks). - powder coated "almost chrome" power adjuster. - powder coated "almost chrome" trigger with red trigger shoe. - Solid cast "ivory" smooth ambidextrous grips. This is also a 2250 tube with a 2240 standard length barrel. - Fiber Optic front sight, not yet blacked out on the sides (for looks). 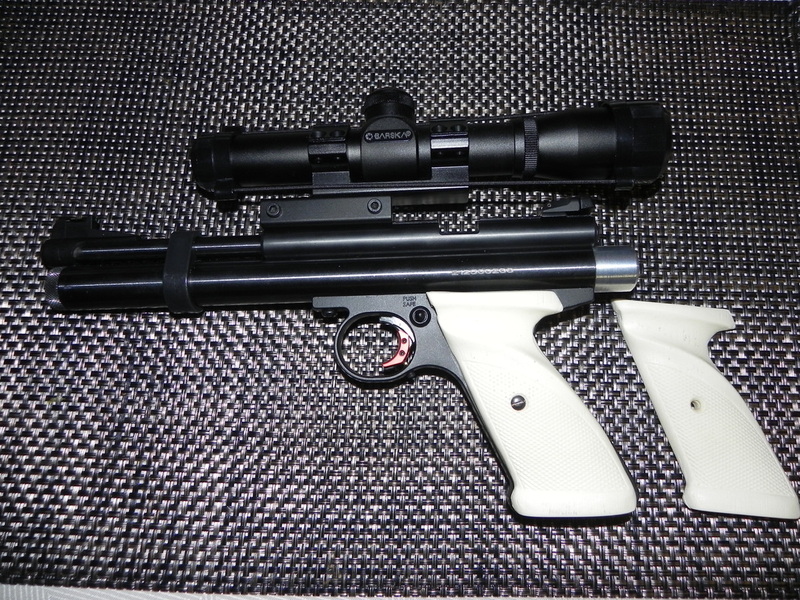 - Crosman black grips with Fusion Red painted center section. We were given the opportunity to build a fine gun for a great customer. neighbor friendly air gun per the customer's request. Thanks, Ron! A very special build indeed! On this one, we pooled all the good stuff (sourced mostly from Alchemy AirWerks , but with a few choice parts from some other craftsmen as well). This was a special built raffle gun to raise funds for a sweet little girl (Haiven) that is stricken with Tay Sachs disease for which there is no cure. She is the grand daughter of a CAPOF and GTA forum brother that we wanted to help with the doctor bills. Haivens Mom and Dad were recently (9/2014) blessed with a new baby boy (Haiven's new brother). weight, powerful, accurate and neighbor friendly pump carbine with laser optics. just have to make one of these for me! it can be positioned below, left or right of the barrel. bi-pod to the barrel of a 2400KT. A very custom 2240 -based carbine built by a great guy that used many of our parts (including the faux carbon fiber carbine stock). Thanks for the great picture, Todd!